Got a big wad of dollars and need to work out how much you want to spend on different projects? Need a quick-and-dirty way to break up the budget? Get in on the budget allocation calculator! 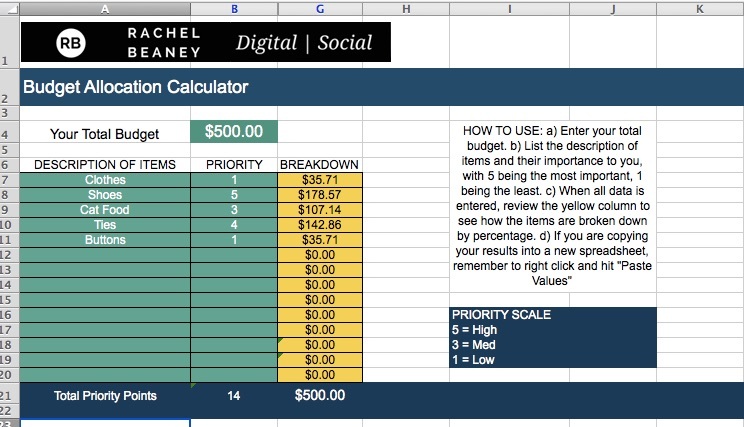 This excel spreadsheet is a tool to help you break down big budgets into smaller budgets, based on priority. If you know your total budget and the projects you need to split your budget across, simply type in their priority to you, and the calculator will divide up your budget for you. Easy! This is a tool to help you break up your budget for simple projects. For a full-scale preview of this tool, please click here to see a screenshot.